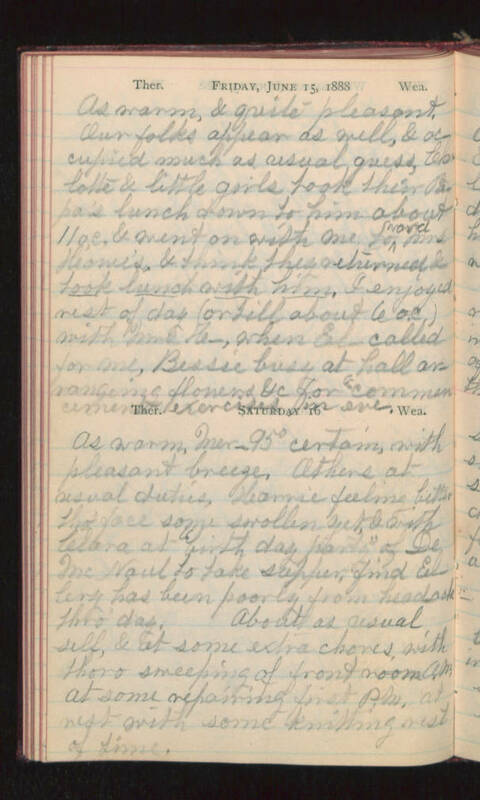 Friday, June 15, 1888 As warm, & quite pleasant. Our folks appear as well, & occupied much as usual, guess, Charlotte & little girls took their Papa's junch down to him about 11 o.c. & went on with me toward Mrs Home's, & think they returned & took lunch with him. I enjoyed rest of day (or till about 6 o.c.) with Mrs H-, when El- called for me, Bessie busy at hall arranging flowers &c for "commencement" exercises in eve. Saturday 16 As warm, Mer-95 degrees certain, with pleasant breeze. Others at usual duties, Karrie feeling better tho' face some swollen yet, & with Clara at "birthday party" of De McNaul to take supper, find Ellery has been poorly from headache thro' day. About as usual self, & at some extra chores, with thoro sweeping of front room A.M. at some repairing first P.M. at rest with some knitting rest of time.